The French philosopher Pierre-Joseph Proudhon once famously declared, “all property is theft”. In the case of land ownership in the UK there is a substantial amount of truth in that proclamation. The concept of private land ownership in the UK can be traced back to the 13th century when King Henry III legalised the appropriation by the nobility of open fields, pastureland and other areas that previously had been deemed to be common land. Over time, this legalised theft of common land by the aristocracy became known as “enclosure” and it was a practice that continued until well into the 19th century. Thanks to enclosure we have today ended up in a situation where 0.3% of the British population, the majority of them aristocrats, own 37 million acres of land while the rest of us spend our lives struggling to afford to live in homes built on just 4 million acres. Furthermore, this wealthy landowning minority receives government and EU subsidies totalling some £4.3 billion each year and yet is not required to pay land tax. The remaining 99.7% of us pay £10 billion each year in Council tax, a land tax based on the size and location of the property we live in. In this context the allotment – a strip of common land upon which a tenant can grow produce to feed themselves and their family – seems like a throwback to pre-13th century feudal Britain. However, its origin is much more recent than that, and can be traced back to a strike by Warwickshire agricultural workers in the early 1870s. Although their strike was principally about poverty pay, the workers were also protesting against the wealthy landowners who had thrown them off common land through the use of enclosure legislation. One of the strike’s principal supporters, Jesse Collings, came to believe passionately that if workers had the means to grow their own food they would not be forced to accept poverty wages from the landowning farmers. Collings later became an MP and it was in large part to his influence and determination that the 1887 Allotments Act, the 1892 Smallholding Act, and the 1908 Smallholding and Allotments Act came into existence. This legislation not only gave local authorities the power to acquire land for municipal allotments it also made it a duty for those same local authorities to provide land for allotments. But now the coalition government and financially stricken local authorities seem determined to unstitch that legislation. Many Councils are currently looking to offload responsibility for their allotment sites. In some Council areas allotment sites have already been auctioned off to private owners with outrageous consequences, as happened for example with the Lowca Lane allotment site in Workington. In Watford the Council, with the support of the Secretary of State for Communities and Local Government, Eric Pickles, is attempting to appropriate the town’s Farm Terrace Allotments for lucrative housing development. There, the allotment holders are not giving up without a fight and have mounted a legal challenge to the Council’s plans. All of this is happening at a time when poverty – from which the allotment movement arose – has again become a widespread fact of life in the UK. According to the charity Barnados, 3.6 million UK children – almost a third – now live in poverty in the UK, and 1.6 million of these children live in severe poverty. Contrary to the government’s “shirkers and strivers” rhetoric, over half of the children currently living in poverty are in a family where someone works. And according to the Tressell Trust, the number of people relying on food banks in the UK has tripled since the Bedroom Tax was introduced in April of this year. Jesse Collings would be turning in his grave. That’s enough politics. Time for a recipe. I grow several varieties of leeks on my allotment plot, the Circus Garden. 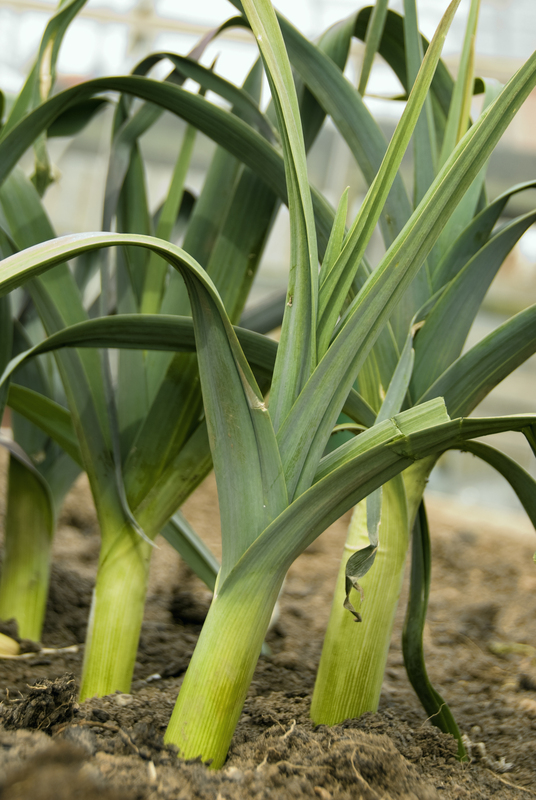 It’s a resilient vegetable that traditionally stands firm throughout the winter weather, although climate change has recently introduced a devastating new predator to the British Isles – the tiny but destructive leek moth. Leek moth larvae burrow deep into the stem of the leek, eventually causing the plant to rot. There is currently no known organic treatment so I grow my leeks under fine mesh. This is by no means foolproof but so far is the most effective preventative measure I have found. This particular dish began life as a savoury strudel but has since evolved into an open tartlet. Tarragon, leek and mushroom are a great flavour combination and this recipe works well as a light starter or lunch, served with a simple, crisp green salad. I used ramekins to make individual tartlets but if you prefer you could make one large tart using an ovenproof dish to mold the filo casing. 1. Heat the olive oil in a frying pan over a medium heat. Add the onions and cook for 5 minutes, stirring, until they have become soft and translucent. 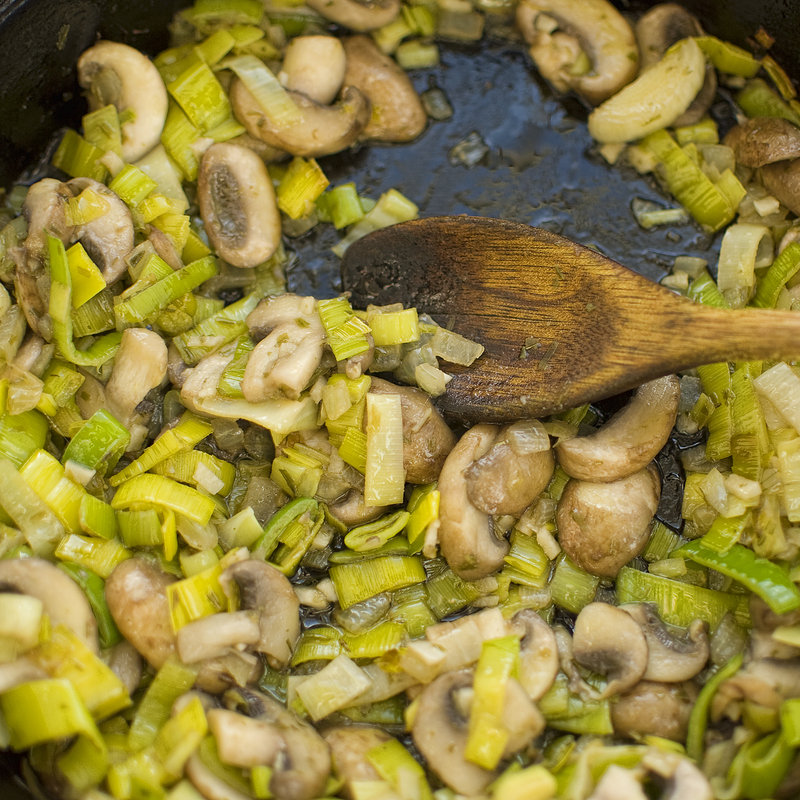 Add leeks and cook for a further 2-3 minutes until the leek has softened before adding the mushrooms and garlic. Continue to stir and cook for a further 5 minutes. Add the salt and the tarragon, stir and remove from the heat. Allow to cool. 2. Pre heat the oven to 175˚C (350˚F, gas mark 3). In a mixing bowl add the marscapone, eggs and Parmesan cheese and whisk together until smooth. Add the cooled leek and mushroom mixture. 3. Gently heat the butter in a pan over a low heat. When melted, remove from the heat. Brush four ramekins with melted butter. Take a sheet of filo and brush with melted butter before placing it in the ramekin mold. Add each new filo sheet at a slightly different angle to the one below it. Repeat this process until you have 5 or 6 layers in each ramekin, with the base and sides of the ramekin being fully covered. 4. Carefully spoon the leek, tarragon and mushroom into the ramekin filo pastry cases. Bake in the pre heated oven for 25 minutes or until the pastry is golden brown and the filling is set. Many thanks, Craig. That is such an apposite quote.